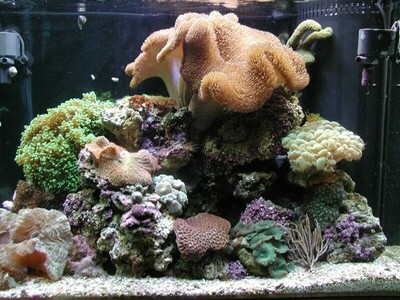 It is only natural for someone to look for a “formula” for the perfect reef tank. Anyone starting out in this hobby needs to understand that there is more than one way to create a beautiful reef aquarium. This simple fact will keep you from pulling out your hair out as you try to make sense of the enormous amount of information available today. A beginning reef aquarist is surrounded by an incredible amount of conflicting opinions, questionable products, and unsubstantiated “facts.” Because of this, it is very important to have a basic understanding of why certain methods are used and what makes them successful. This way you can form your own opinions and greatly reduce the amount of aquarium refuse that fills your garage. It is unrealistic (to say the least) for me to attempt to produce an article that will include all the things that someone will need to know to keep a reef aquarium. There are many excellent books on the subject that will prove to be invaluable tools for an aquarist at any level. In this series I will raise some topics that the beginning aquarist should consider when setting up a new reef aquarium. Establishing a basic budget will dictate many decisions that you will have to make. I don’t want to say it is all about money, but even doing a somewhat minimalist style reef can drain the bank even before you add any animals. The first step is to look around at your local aquarium shop to get a rough idea of how much things cost. It is possible to create an attractive display without spending a lot of money. However, just like other hobbies there are certain aspects that you do not want to skimp on; e.g., lighting, filtration, etc. The second step is to do research. Understand what reasonable expectations are when considering your time and budget. For instance, a relatively small aquarium with mushroom anemones is certainly going to be less strain on your wallet and maintenance time than a stony coral tank. As you look at various displays it is important to remember that the expense of a reef does not end with the initial set up. You will have some maintenance costs to consider.Simple, yet costly tasks, such as replacing light bulbs every 10-12 months or keeping up with various chemical additives, can be the difference between an exquisite display and an algae covered mess. The key is to look at what others have done and decide what you can afford for yourself. Once you have decided what you would like to have, now comes the fun part, choosing your aquarium. Although the tank itself may not be the most expensive component of your set up, it will dictate many things about your system such as lighting and filtration. Try to avoid aquariums that are more than 24 inches tall, for the simple reason that it is more expensive to illuminate deeper tanks (not to mention that your arms may not be long enough to readily reef garden at the tank bottom). If you want a larger tank, try to find one that is wider. For instance, going from a 12 inch wide tank to an 18-inch wide (or even 24”) tank is my preference. The reason for this is two fold. First off, wider tanks are much easier to aquascape. As you place the live rock in the tank, you will realize that the caves and overhangs that give your reef interest are much easier to create in a wider tank. The second reason is that when you consider the other expenses in setting up a reef the additionaloutlay for a wider aquarium is well worth it. Take lighting for example. It is probably one of the most expensive components of your tank, and you will find it doesn’t cost a lot more to illuminate that extra 6 inches. For instance, if you are considering a 55-gallon aquarium (48”x12”x20”), I would suggest looking at a 75-gallon (48”x18”x20”). You will get a lot more reef for your buck. Try to find a place where you spend time, such as living rooms, offices and dens. If possible try not to place the aquarium too close to a window or sliding glass door. This can cause a few problems. These areas tend to be warm in the summer from solar gain and cold in the winter due to poor insulation. This can make your heater or chiller work unnecessarily hard. The additional light can make it more difficult to control algae, especially if you want to have the tank lights on when you are home in the evening. Make sure you have a power outlet nearby. It’s wise to arrive at a rough estimate of the Amps that you will need to run your tank so that you never have to worry about tripping a breaker. Try to keep power strips mounted where you can easily reach them and water cannot drip into them. The use of GFIs (ground fault interrupts) will help protect you from getting shocked in case a light falls into the water or if a pump goes bad. The downside to them is if they trip and you are not around, everything goes out. So if you are uneasy about this, you may want to forgo the surge protection on your main circulation pump. Having access to water for water changes and an area to discard wastewater is a big plus. You will be a lot happier if you don’t have to carry jugs of water up and down stairs. Avoid areas that could affect the temperature of the tank; e.g., close to heating and cooling returns as well as rooms that have unstable temperatures. It is important when selecting an aquarium to have an idea which types of animals you would like to keep first. Some of the corals pictured in this 65 gallon aquarium can outgrow their space in a relatively short time and will need to be cut back so that other corals can thrive. 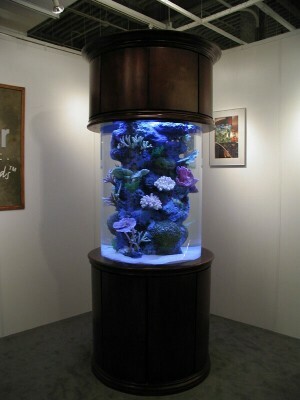 The light fixture pictured here could be used for either of these aquariums. Since you would normally pay hundreds of dollars for this type of fixture, it is my experience that the wider tank is always a better investment. Although acrylic offers many unique shapes, extreme care must be taken when cleaning. Now that you have decided where you are going to place your aquarium and how big it’s going to be, you will need to decide what the tank will be made of. Most people will be choosing between glass and acrylic. There are advantages and disadvantages to each type, and this is one of those areas where personal preference is going to come into play. Acrylic is clearer than glass and offers a wider variety of shapes. However, one major drawback of acrylic is that it is easily scratched. This is an important factor with the reef aquarium because with increased lighting comes increased algal and diatom growth. These algae are often the hard encrusting type – coralline, for example — and with constant scraping the chances of scratching the tank are high. Advocates of acrylic tanks will quickly point out that scratches can be buffed out, but this is not as easy as it sounds and has to be done in to a dry tank. In my experience it is rare that someone is going to break down theirestablished reef to fix scratches. Glass aquariums, though not as easily scratched, do have silicon seams that must be avoided when cleaning. One way some aquarium manufacturers are getting around this is by providing wooden corner covers that hide the unsightly green seams and give the aquarium a more custom look. One small drawback to glass aquaria is, unlike many acrylic tanks, you need to attach some sort of background. Some reef keepers do not concern themselves with the background of their aquariums. They feel that since the reef will be stacked up with rock and corals there is no sense worrying about it. Although it is true that the rock and corals will cover some, I have noticed a trend by many aquarists toward having a lower rock structure in order to allow their corals more room to grow. 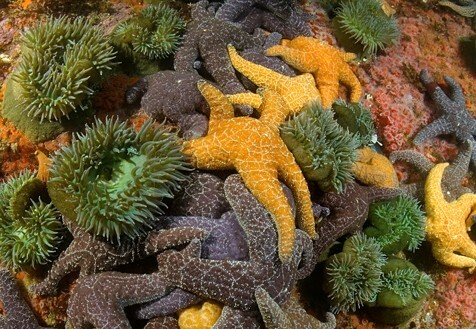 Aquarists often depend on the algae (coralline and otherwise) to cover the back glass. This type of background not only takes time to establish, but it limits you to a green or pink background. I have seen some beautiful reefs where the owner takes the time to keep the back glass clean so that they can have a blue background. If you are like most people and you are going to view the tank from one side then I suggest that you consider using some sort of solid background to hide the various wires and tubes that will run down the back of the tank. If you choose one of the roll out types be sure to use packing tape across the entire edge to prevent any water from finding its way behind the backing and detracting from the look. Although painting the back does work, you must be careful not to let salt creep to build up on it because when it builds up and falls off (or you scrape it off) generally the paint comes off as well. Whether you choose glass or acrylic if you are building a reef that is over 30 gallons, chances are that you will need to drill one or more holes in the aquarium for overflows, returns, etc. If you are buying a new aquarium you will have the luxury of getting one that has been predrilled at the factory. Most major aquarium manufacturers sell tanks that have built in overflows. This is nice because it looks professional and just as importantly it comes with a warranty. You can have the tank drilled, provided the bottom or sides are plate glass, not tempered. Many of your higher end aquarium stores have the capability to drill tanks, or you could inquire at your local glass company. You can purchase (or make) a “hang on the back” type of overflow. This is a very convenient solution provided you have enough room behind the tank (usually around 4-5-inches). If you use this type of overflow, be sure to check the recommended flow rates. 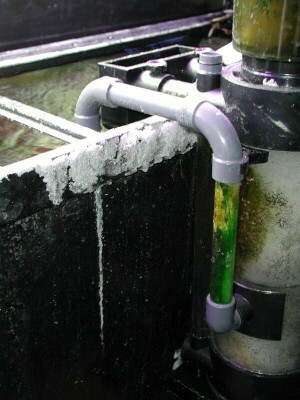 Often, if the flow rate is too slow, the siphon tube that is used collects enough air bubbles to break the siphon and flood the aquarium. Regular cleaning can protect your background as well as anything else around the aquarium. 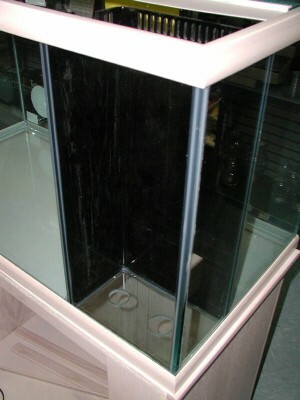 Most aquarium manufactures offer predrilled aquariums that take the guesswork out. Regardless of the type of overflow that you choose, it is important to remember that the aquarium needs to be level. Many people don’t realize how important this is until they have their tank full of water, and discover that most (or all) of the water of the water is going out of only one of the overflows. At first this wouldn’t seem like such a big deal, but not only are losing circulation on the higher side, but the overflow that is working is too noisy. The longer the aquarium, the more dramatic this problem is. So before you fill your tank, be sure to put a level across the top lengthwise and front to back. Use shims to level the tank completely, because on a 6-foot tank, even 1/4” can make a difference. In order to keep your aquarium level over time, it is crucial to keep in mind that in some cases the weight of the aquarium can cause sagging in the floor. Salt water weighs 8.5 lbs./gallon. So if you are setting up a 90-gallon tank, once you add rock and sand, you are putting upwards of 1000-lbs. on your floor. Be sure that the area is supported properly. If possible, position the tank perpendicular to the floor joists, near where the joists are supported by a support wall. This is especially important with large tanks. As you can see from this small introduction, there are many things to take into account when setting up a reef aquarium. Something as straight forward as selecting the proper size or place for your aquarium can lead you to a myriad of other decisions. The simple fact that you are reading this article illustrates that you have already learned one of the most valuable lessons that I could convey, which is to do your research first. As you explore various aspects of this hobby, you will find there are volumes of information available for the beginning reef aquarist. Therefore, by reading all that you can, you will acquire the theoretical knowledge you will need to start a beautiful reef. And, after time, this will combine with the practical knowledge necessary to make you an advanced aquarist.